The coat of arms of the FSA which incorporates the coat of arms of Syria; used from July until November 2011. 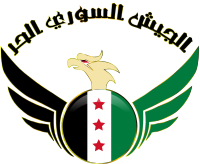 The coat of arms of the FSA which incorporates the Syrian independence flag; used since November 2011. Areas of conflict and displacement (light purple), refugee camps (yellow triangles), displaced in host homes (green houses), FSA held territory (red), June 2012. 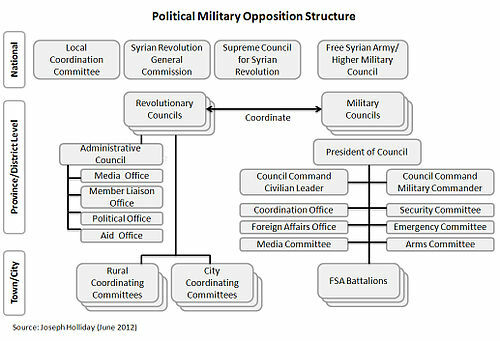 United States in 2015 and operating in eastern Syria which considers itself to be part of the FSA. 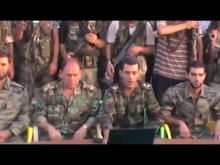 Wikimedia Commons has media related to Free Syrian Army.